Sugar is one of our absolute least favorite ingredients in the grocery store—and there are so many reasons why. A recent study conducted by the Wall Street bank Credit Suisse revealed the bitter truth about global sugar consumption: The study found that sugar makes up 17 percent of the global diet. The daily average consumption for the world is 17 teaspoons (68 grams), which is 45 percent higher than 30 years ago. In the United States, which tops the list for sugar consumption, the amount is far greater; Americans average 40 teaspoons (160 grams) a day, or 3 pounds of sugar per week. In 2014, the World Health Organization (WHO) recognized the not-so-sweet dangers of sugar and drafted guidelines recommending that people around the world limit consumption to 5 percent of their diet. This means that one of the most highly respected global health organizations thinks that 5 percent, or 25 grams, is the maximum amount of sugar you should take in daily. Did you know that a 16-ounce can of soda usually contains 40 grams? 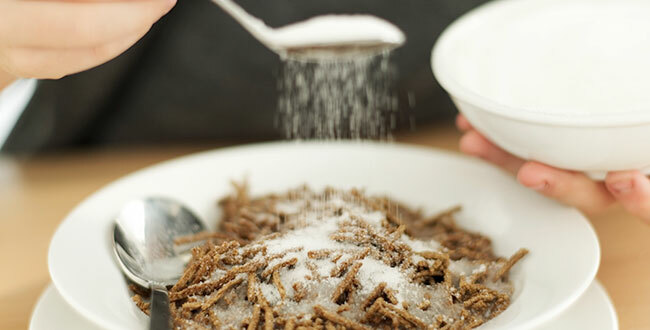 So what makes sugar top of our list of poor food perpetrators? This perp is one of the biggest roadblocks on your path to micronutrient sufficiency because it can deplete your body of micronutrients and also block micronutrients from being absorbed. Additionally, there is absolutely no evidence of any health or nutritional benefit to eating refined white sugar. While sugar's sweet flavor may be appetizing, its depletion of calcium, magnesium, chromium, and copper in the body is not, especially when you consider the negative side effects of becoming deficient in these essential minerals. Vitamin C is also affected by sugar; because of their similar chemical structures, vitamin C and glucose (a type of sugar) compete for entry into your cells. Even slightly elevated blood sugar levels can block vitamin C from getting in and can cause a weakened immune system. Be on the watch for signs that you are deficient in these important nutrients. Consult your primary care physician if you think you're nutrient deficient before adding a new supplement to your diet. • Magnesium: Sugar cravings, nausea, vomiting, fatigue, cramps, numbness, tingling, seizures, heart spasms, personality changes, increased heart rhythm, hypertension, coronary heart disease, osteoporosis, asthma, constipation, insomnia, depression. Do you crave sweet foods and then find that one bite leads to two and then three? If you answered yes, you are not alone. Uncontrollable cravings are one of the major reasons people fall off their diets. As researchers have stated, "food cravings are clearly a separate phenomenon from hunger." So if those unyielding cravings that wake you up in the middle of the night insisting on a bowl of ice cream aren't from actual hunger, then what is causing them? Would you believe it is a deficiency in specific micronutrients? When your body ingests sugar, your calcium and magnesium levels can become diminished. And guess what scientists discovered happens when those levels fall short? You crave sugar! That is why one bite leads to another and then another. And with every bite, your levels of calcium and magnesium are further reduced, increasing your desire for more sugar. Your internal "cravings monster" calls out louder and louder, and there are only two ways to quiet him. You can continue on the path to deficiency and obesity by eating more and more sugar (with every bite making it more likely you will get osteoporosis and other deficiency diseases) or you can stop the cycle altogether simply by taking steps to become sufficient in calcium and magnesium. It really is that easy.